Preheat oven to 375ºF. Slice the ripe Tomatillos in half. Toss with a little olive oil to coat lightly but evenly. Roast cut side down in a baking dish until the skins begin to backen and their juices have thickened. At the same time, roast the peeled Garlic cloves, drizzled with a little olive oil, in an aluminum foil packet, until soft. 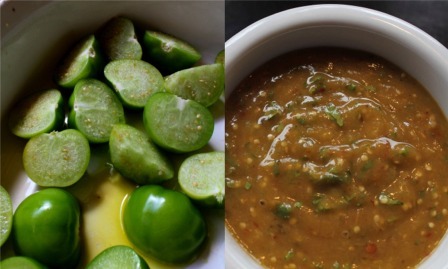 In the food processor, puree the roasted Tomatillos and Garlic with the sugar, salt, Chipotle Chilis and adobo sauce. Transfer to a bowl and stir in the fresh Cilantro. Enjoy!